With advancement in construction technology, gone are the days when construction workers were hired based on recommendations. Today, when every field demands a precisely documented resume that helps to assess the candidacy of an individual, how can construction industry be far behind. The industry in which vendors and workers are hired on a contractual basis, a well-written and concise resume would be an effective way to prove your worth and ensure longevity in a role. The resume is a precise explanation of your expertise. Any employer is going to judge a candidate on the basis of this scripted document and determine whether he or she is the perfect fit for the job. The construction industry offers different job profiles such as masonry worker, welder, carpentry, construction project manager, or construction inspector. Just as you would construct a new apartment or project with utmost care, similarly, it is also necessary that you pay attention to what goes into the resume. Whether you are applying for the post of a construction superintendent or any other site worker, it is vital to show off your potential. To do that, you need to draft a concise resume that comprises of all the main keywords and relevant phrases that the recruiter usually looks for. Although the employees in this field are given the responsibility of handling huge and complex tasks, the resume must ideally be no longer than a single or at the most double page document. Failing to brush up your marketing tool as per the latest trend in the industry can keep you devoid of many wonderful opportunities that might come across your path. As this industry mostly includes blue-collar jobs, it is necessary to understand the format for your resume. If you have gaps in employment history, then going for a functional resume is the best choice. However, for individuals who are into the field for long, the format of your document would depend on what position you are interested to work in. For a fresher, the focus would be on relevant skills, for a mid-level position, on job-training experience which reflects specialized skills whereas for senior positions, expertise in various tasks would be most pertinent. Opting for a combination resume helps in clearly communicating your candidacy to the recruiter. Starting your document on the right note is essential if you want to capture the recruiter's attention. Once contact details like full name, email id, and mobile number are properly mentioned, the next part is to prove why you deserve the job. Add a concise job objective or career summary, whichever is suitable for the application. This is a small introduction of your profile, stating skills and experience. Being too wordy and including long sentences might present you as a vague candidate, and might knock you off the competition. As this industry mainly deals with on-site projects, the bullet points should mostly include skills learned from experience. Stating your achievements with the right use of action words and figures can increase a hiring manger's interest in your profile. Begin the bullet points in your work experience section with action verbs and adjectives that are present in job description and relevant to the construction resume. Example of such words is Streamlined, Managed, Structured, Revamped, Coordinated, Supervised, Scheduled and many others. Including skills and educational section is similar to what is followed for a chronological resume. To stand out from the crowd, include a separate credential section where you can highlight all professional certifications, licenses and affiliations relevant to the industry. The resume must be legible which makes it easy for the hiring manager to scan it in seconds. While drafting a grammatically correct document free from spelling mistakes is the prime requirement, never forget to include quantitative achievements such as major projects along with budgetary responsibilities, supervising staff, contributing to revenue growth or coordinating with contractors as these points would be definitely be searched in a construction resume. With the help of construction resume samples given on our site, we are confident that you will be able to draft a perfect resume for any profile in construction industry you want to work for. 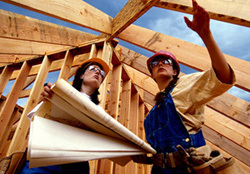 Also check our page on builder resume.